For the entire hour I spent in the car driving home last night I was wondering how in the world I would begin this post. So I guess I’ll just begin with the conundrum I faced in the morning. What to wear? I know, it’s a baseball game, I don’t have to worry about matching ties and shoes. But the last couple of times I’ve gone to Nationals Park to see the Marlins, my trip up Half Street has not been fun. The racing presidents roam outside the gates prior to the game and they always meddle with my Marlins attire. Last year my hat was thrown about 90 feet by Teddy Roosevelt…no joke! So I decided to be a master of disguise for this game. 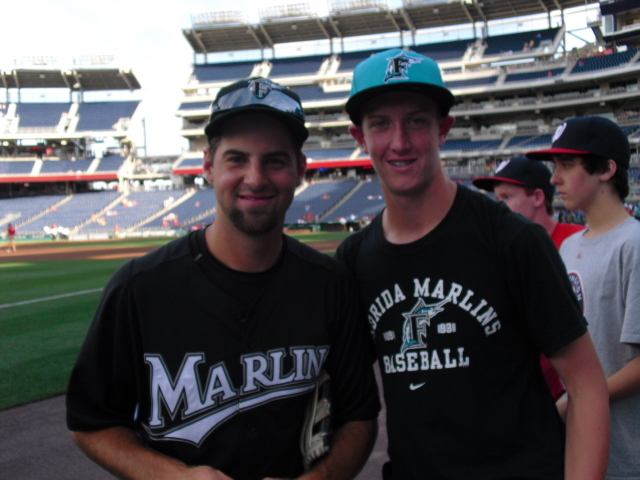 I wore my starts and stripes Marlins shirt with a Nationals hat. You’ll see that look in a little bit. Changing subjects here. I emailed Zack Hample (if you don’t know who he is, click on his name) on Tuesday asking him if he would be attending the game. He responded and said he was considering it. The email response came at 2:50 a.m. so I was a bit concerned he would be too tired to go since he was still in New York City. 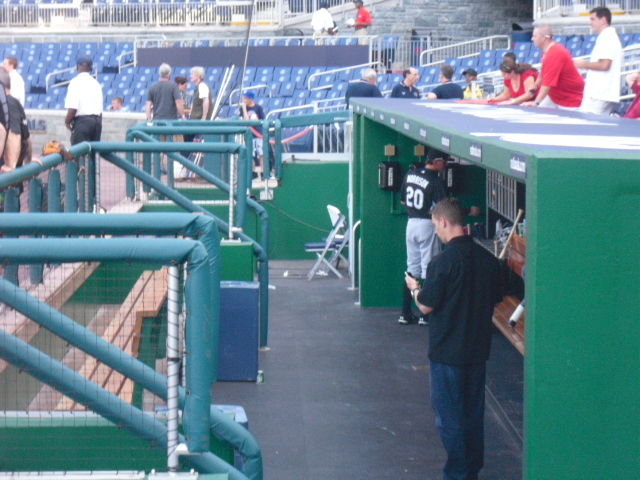 So there I was at 4:40 chilling out in left field in Nationals Park when I heard someone running down the walkway. I turned and greeted Zack, reminding him I emailed him yesterday. He remembered and conversation ensued. However, it’s hard to converse with a ballhawk at work. 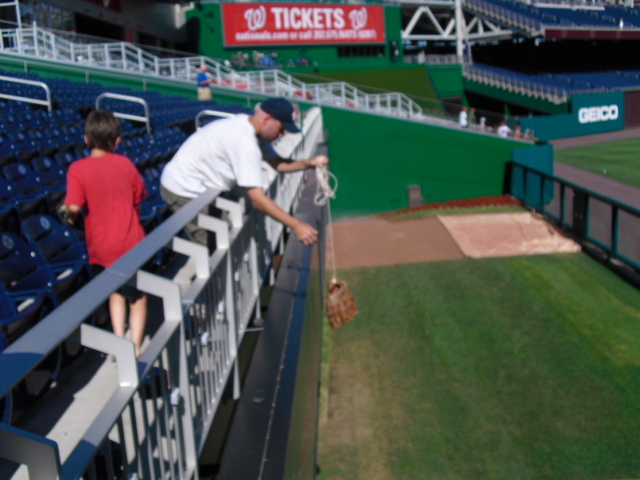 Over the course of the Nationals batting practice, very few balls were thrown into the stands in left field. And when Tom Gorzelanny or Sean Burnett did throw one in, it was to a young kid in the front row. I brought my glove trick to the game, but didn’t use it when the time came. But someone else did. I sent a few of these pictures to Zack so they might be on his blog as well. This weekend he mentioned a kid he met up with in Baltimore who was fifteen years old and taller than him. He was a bit perturbed, so I decided not to mention I was only 14. “Anibal!…Anibal!” In my best fake Venezuelan accent. He looked back at me, and not knowing if he spoke much English, I gestured a throwing motion. He threw the ball to me and looked away. That’s not what I wanted. He looked back, and I threw the ball back. “Oh, you want to play catch?” he replied in his real Venezuelan accent. “Yeah!” So we threw a couple times each before he let me keep the ball. The other fans got a kick out of it, and so did I. Sanchez has never seemed to personable to me or any other Marlins fans in recent years, but this was by FAR the best experience I’ve had at a Marlins game. 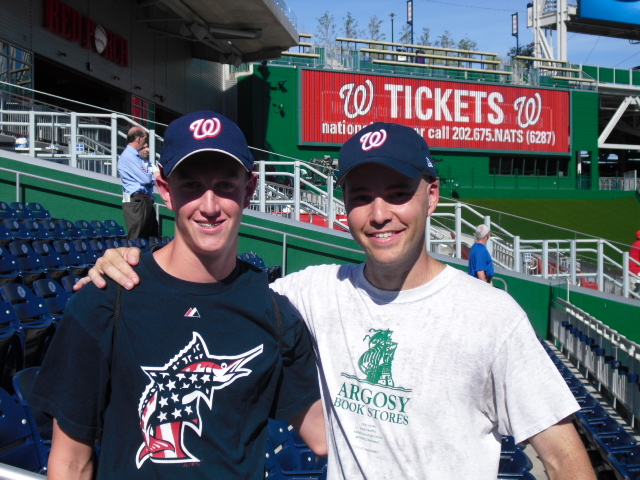 Meeting Zack Hample was pretty cool too, so both in the same day was amazing. I haven’t even gotten to talking about the game and I’m barely halfway there. I had only been in the park for about an hour at that point. The gates then opened to the rest of the stadium, so I went down to the Marlins’ dugout. For the record, Hanley Ramirez is the worst autograph signer in the history of baseball. Not that he doesn’t sign, he just does it the hard way. When he was walking down the dugout steps from batting practice, he let a fan from the dugout toss him a ball and pen. He handed the ball to a man dressed in civilian clothes standing to his left, and proceeded to set down his batting materials and and take a seat on the bench. He whipped out the pen and took the ball from his assistant. He took 10 seconds to sign the ball and handed it back to the man with the pen. It was then returned to the guy above the dugout. One autograph, five minutes. There was a complete exaggeration when it came to the time period right there, but I’m sure it seemed like five minutes to the guy who was thinking he just threw a ball into a black hole instead of a baseball player. The opposite of Hanley would be Mike Cameron and Wes Helms who both came over to the short railing to sign for the small crowd of fans. It took them around two seconds per signature. When the Fish finished batting practice, the players vacated the field. But Burke Badenhop was talking to a group of fans who he knew. I went over and got my picture taken with him. See, I told you I don’t look good in that hat. For your in information, I’m not taller than Badenhop (6’6″). He was sitting on the railing I believe. The game was great! Mike Cameron homered twice and Mike Stanton once. I’ve seen Mike Stanton play in three games at Nationals Park; he has homered in all three. The Marlins led 7-1 going into the bottom of the ninth inning, and all the fans were leaving. But the Nats weren’t done yet. Ryan Zimmerman hit a ground-rule double into right field, followed up by a Michael Morse single. These clutch hits followed a parade of base runners to start the inning off. By this point, the Nats had scored four runs and it was 7-5, runner on first, Lance Nix up. Nix had homered earlier in the game, and on Leo Nuñez’s first pitch, he cranked a majestic drive to right field. Everybody thought it was gone, including myself. But Mike Stanton made the grab on the warning track for the final out. I was insanely tired after six plus hours in the park and didn’t bother trying to find Zack Hample in the mass of people exiting. 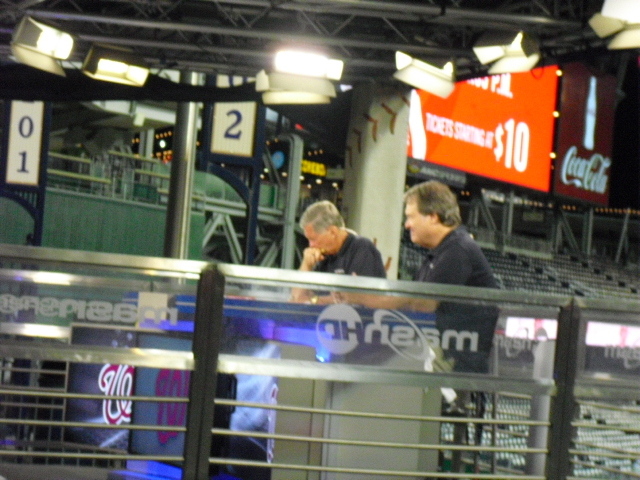 While we exited the stadium, I stopped to watch part of Nats Extra in left field. As I said, I was wondering how to begin this post on the drive home, and I think I have covered everything, in a nutshell at least. I’m ending this post in a little bit and still haven’t figured out a title, darn! I have no clue how many total balls Zack got, but it was a lot more than my one. The Fish are just about to sweep the Nationals. They’re leading 5-2 in the ninth, wait make that game over. The Fish swept the Nationals in three games and are now just a game under .500.